Two championships since 2004, and they aren't done yet. That you can put in the bank. The one time perennial losers, are currently major league baseballs model franchise. You guessed it, I'm talking about the Boston Red Sox. American League runners-up in 2003 and 2008, World Series champions in 2004 and 2007, the Boston Red Sox have built an organization that can compete for a championship, every single season, no doubt about it. 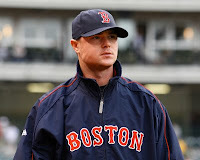 With the announcement late Sunday night, that 25-year old left handed starter, Jon Lester, will be a Red Sox till at least 2013, it has become evident that the Red Sox have more than a plan in place. Since the 2008 postseason ended, with the Red Sox losing in a decisive game 7 of the ALCS, the Red Sox have begun locking down their young core of home grown talent, piece by irreplaceable piece. In 1959, Chicago White Sox second baseman, Nellie Fox, won the American League MVP. Before 2008, a period stretching nearly 50 seasons, no other second baseman had won the award. Come 2008, Boston Red Sox second baseman, Dustin Pedroia, took home the American League MVP by leading the Red Sox into the postseason. Only one season after taking home the American League Rookie of the Year, Dustin Pedroia came back with an exceptional sophomore season in the big leagues. Pedroia, at 5'9", hit .326, drove in 83 runs, and clubbed 17 home runs this past season. The Boston Red Sox and general manager, Theo Epstein, rewarded the 25-year old Woodland, California native with a six-year contract that could keep him in Bean Town till 2015, paying him up to $40.5 million dollars. After what Epstein and Co. dealt with this past summer regarding super slugger, Manny Ramirez, the extension given to Pedroia is a clear move to make commitments to players who want nothing more than to win championships every single season. The Red Sox didn't stop with locking down the 2008 American League MVP. 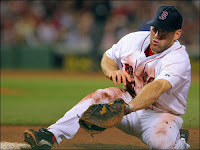 Mid-January, the Red Sox returned to the table with the 2008 Hank Aaron Award winner, Kevin Youkilis. (The award is given to the leagues top offensive player) One could make the argument, and I'm that one, that Kevin Youkilis is the most important non-pitcher on the Boston Red Sox. Not only can Youkilis dominate at the plate, he's a gold glove first baseman and can also play exceptional defense across the diamond at third base, his original position when called up to the majors. From his first season in the majors in '04, Kevin Youkilis has improved his batting average every year. In 2008 alone, Youkilis hit .312, hit 29 homers, and drove in 115 Red Sox, good enough to finish third among AL MVP voting. The 29-year old is one of the best hitters in the major leagues. In his first three full seasons, Youkilis has recorded on average 159 hits per season. When evaluating Kevin Youkilis, ask yourself how many first baseman in the majors can bat anywhere from 2nd to 6th in the lineup, and at each place within the lineup give you what you need. With question marks surrounding an aging and injury prone Mike Lowell, the Red Sox place great value in having a first baseman that can play both sides of the infield without giving up a lick of defense. In mid-January they locked up that value for the next four seasons, possibly five at more than $40 million dollars. On Sunday, the Boston Red Sox made a commitment to their left handed ace, Jon Lester. After defeating non-Hodgkins lymphoma during his rookie season, Jon Lester hasn't looked back. The Red Sox lefty is set to remain pitching at Fenway Park through possibly 2014, and based on what we've seen from him, it'll be a great four seasons. The Tacoma, Washington native who has already started a World Series clinching game and recorded a no-hitter, all before the age of 26, is one of the games most talented young pitchers. 2008 was a breakout season for Lester. He managed to record 16 wins and only 6 losses in 33 starts. Lester pitched two complete games and finished fourth in lowest earned run average among American League starters at 3.21, pretty impressive for kid just 59 starts into his major league career. Lester remains the Red Sox left-handed ace and combined with right hander Josh Beckett, gives the Red Sox one of the top one-two punches in the major leagues. Based on this past offseason and the events of the past two days, the Boston Red Sox are securing the cornerstones of their franchise for the next five seasons. When the Red Sox eventually come to terms on an extension with 28-year old closer, Jonathan Papelbon, they'll have four home grown talents that have made their way through the Red Sox system and contributed to at least one championship and won't be leaving any time soon. When the Red Sox GM, Theo Epstein, promised to turn the Sox into a scouting and player development machine, this is what he had in mind. There is how the Sox do business, and then how everyone else does.